Rep. Ilhan Omar fiercely roasted President Donald Trump’s Venezuela envoy Elliott Abrams while diving into his history: she recalled his conviction in the Reagan-era Iran-Contra scandal, US support of José Napoleón Duarte during the Salvadoran Civil War, and Washington’s extensive involvement in Latin American civil conflicts. "In 1991, you pleaded guilty to two counts of withholding information from Congress regarding your involvement in the Iran-Contra affair, for which you were later pardoned by President George H.W. Bush. I fail to understand why members of this committee or the American people should find any testimony that you give today to be truthful", Omar said. The Iran-Contra scandal involved senior Reagan administration officials secretly facilitating the illegal sale of weapons to Iran, which was under an arms embargo, in a bid to use the money to back the Contras, Nicaraguan paramilitaries attempting to overthrow the Sandinista government. Abrams was the assistant secretary of state at the time, and was a key figure in the scandal. When Abrams tried to respond to what he described as an “attack”, saying that it was a “ridiculous question”, Omar swiftly interrupted him, hitting back with “it wasn’t a question”. The Minnesota congresswoman, who earlier called the political crisis in Venezuela a “US backed coup”, further recalled the details of the El Mozote massacre, in which US-trained Salvadoran soldiers killed more than 800 civilians in 1981. “You later said that the US policy in El Salvador was a 'fabulous achievement'. Yes or no: Do you still think so? Yes or no, would you support an armed faction within Venezuela that engages in war crimes, crimes against humanity or genocide if you believe they were serving US interests, as you did in Guatemala, El Salvador and Nicaragua?” she asked. Abrams answered by saying that he didn’t believe “this line of questioning is meant to be real questions and so I will not reply”. Omar went on to say that she wanted to know whether “a genocide will take place and you will look the other way because American interests were being upheld”. Abrams, for his part, said that Washington’s policy in Venezuela was to “support the Venezuelan people’s effort to restore democracy”. 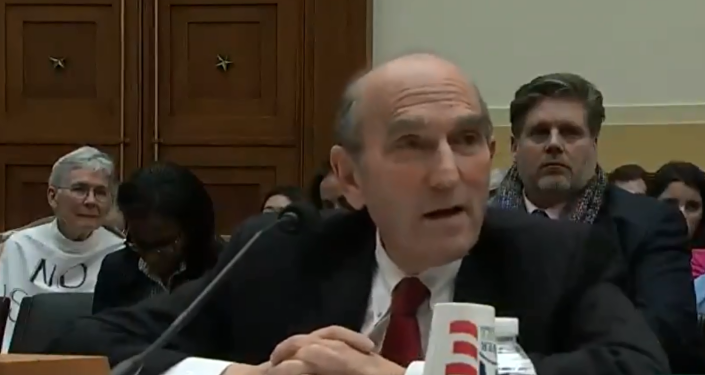 During the hearing, Abrams told members of the House Foreign Affairs Committee that while the Trump administration preferred to resort to economic, humanitarian and diplomatic measures to deal with the government of Venezuelan President Nicolas Maduro, the use of military force remains on the table. “When we say all options are on the table, that is because all options are on the table,” Abrams said, adding that military force “is not the preferred route and not the route we’re going down”. I think she is courageous! She speaks truth to power. We need more like her. She is doing her job that’s way she was elected to be there. Corporate Dems and Republicans have made this country into a storm of ingnorance and barbarism. Bravo 👏👏👏 @IlhanMN rake them thru the coals. For too long we've been allowed to destabilize countries around the world with no questions asked. Thank you for your diligence and bravery. Regardless if you like her or not, (not a big fan) it’s a fair question. The US has blood on its hands in Central America. She needs to be dropped from that committee. This Omar lady is not good for our country. She has an agenda and it’s not good. what does Ilhan Omar know about the military and U.S. interests in Central America? how can she argue with other Congress people that have been there for years? what does she know? How in the hell did she ever get put on that committee? She didn’t even know what she was talking about. She read what someone wrote for her. Venezuela has plunged in a political crisis since the head of the opposition-led National Assembly Juan Guaido declared himself the country's interim president, thus challenging the legitimately elected Nicolas Maduro. The move was instantly recognised by the United States, which has also been encouraging other countries to follow in its footsteps. Besides the introduction of sweeping oil sanctions and financial restrictions on the Maduro government and state-run oil and gas company PDVSA, the Trump administration stated that a military intervention in Venezuela was "an option". Maduro has accused Washington of orchestrating a coup and said that a group of Venezuelan military defectors in Colombia sought to sabotage the national armed forces “at my command”.